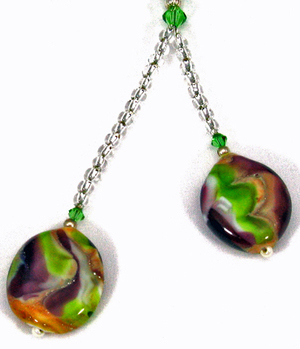 he two handmade beads in this necklace start with white glass wrapped in silver foil which was then melted in. Layers of transparent glass cover part of the bead and a razor was used to cut into the layers of molten glass creating the “emerging” patterns. The necklace is finished with Swavorski crystals and silver lined glass seed beads. The clasp is sterling silver.